* Property 2 – Camp Winape Rd. Project Goal: To gain an understanding of the factors needed for a successful campaign to encourage lakeshore homeowners to develop a buffer using blueberry plants. A. Selecting candidates: Our goal was to find five lakeshore homeowners who had little or no vegetation on their lakeshore. The chair of the Water Quality Committee for Seymour Lake Association, through visits and informal discussions, found homeowners who happily agreed to receive two or more blueberry bushes. She explained to each candidate beforehand the importance of buffers and the idea of promoting blueberries for healthier VT lakes. B. Finding Information and local resources: We identified local resources for purchase of blueberry bushes, searched for planting and care information on the web, found volunteer planters, and contacted local gardening experts. C. Purchasing blueberry bushes and blueberry soil amendments: Peat can be purchased at any farm or garden store. We purchased plants and a blueberry-specific soil amendment at Elmore Roots, a nursery in Elmore, VT, along with jars of blueberry jam to give to bush recipients. 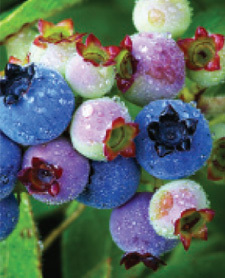 Blueberry varieties included Putte and Friendship, (2 low-bush varieties); Northcountry (a half-high variety); Patriot and Superior (2 high-bush varieties). D. Scheduling: Two volunteers coordinated with homeowners and plantings were scheduled during one day in August. E. Gathering tools for the day of planting: We brought spades, an edger, a bucket, a knife, and garden gloves. A camera was used to document the buffer “before” and “after” our work. A. Before Planting Day, volunteers visited each home and discussed bush placement location. B. On Planting Day we used the same approach with each homeowner. After viewing their lakeshore, we continued discussion about the placement of bushes, giving them the choice of varieties, depending on the maximum height they preferred. Volunteers followed steps provided in “Planting your blueberry buffer.” All homeowners received two or more bushes of the same general type (i.e. high-bush vs. low-bush). Photographs were taken before and after the planting. These photos will be used in promotional materials for our lake association and the Buffers for Blue Lakes campaign. C. Information was provided about how to build a buffer and why it benefits lake health, conditions blueberry bushes require, benefits of using blueberries in a buffer and how to care for the bushes. We emphasized the use of natural or organic compost and mulch, and highlighted the potentially negative impact on the lake of fertilizers, herbicides, and pesticides. D. Concerns mentioned by homeowners regarding stream and lakeshore conditions were brought to the attention of our lake association. A. Homeowners were contacted 1-2 months after the planting to make sure they had no questions or problems. 1. While we used an informal method to locate homeowners for this project, we would advise other lake associations to advertise this opportunity through established channels of communication. 2. One positive outcome was to learn that our association’s educational outreach was effective with at least one homeowner who had already begun developing a buffer. She had relevant questions pertaining to topics we had addressed in workshops. 3. Being very clear about the service you will provide is important; otherwise you may find that a homeowner expects more gardening help than you are willing to supply. 4. Knowledge about invasive plants was an asset. We were able to address a concern that involved identification and removal of a plant for which the blueberry plant replaced. 5. Blueberry bushes thrive in acidic soils. Because we used native bushes and cultivars that do well in Zone 3, and soil amendment that had pH lowering elements, we did not test the soil ahead of time. Soil testing kits are available at Agway stores. Soil samples could also be obtained before Planting Day and sent to UVM for testing if you wish. 6. We did not provide pine mulch or pine needles for a pH-lowering mulch. Homeowners should be made aware of this need at the outset. Master Gardeners – 1-800-639-2230 (hotline) http://www.uvm.edu/mastergardener/ provides education and troubleshooting. Vermont Conservation District – Dayna Cole, District Manager Orleans County, dayna.cole@vt.nacdnet.net provides guidance and how-to for homeowners wishing to develop a lakeshore buffer; offers native plants, bare root, at 20% of cost (Orleans County only). Boyscouts of America – a local troop can be contacted for help in planting.